Edited by blob2 at 21:21, 23 Mar 2017. Well we already got another interesting 1-drop in the form of Glacial Shard. 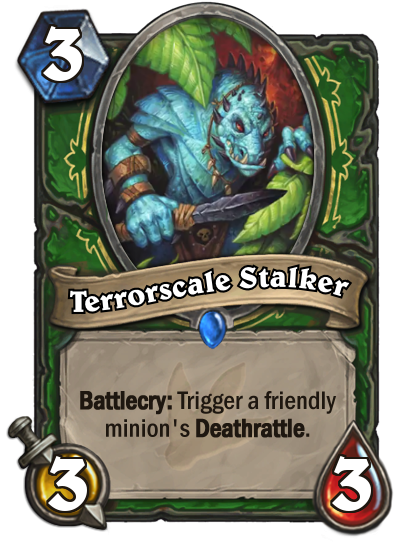 I even think this might be a potential cancer, or yet another all-rounder especially good against aggro/weapon classes. BTW guys a bit offtop but tommorow there's a chance I'll get my hands on WoW Chronicles vol. 2. First part is a great read and this one covers Orc origins and Orc vs. Humans wars. Haypuu! I just looked up those WoW Chronicles. I really want them as well. So people think Hunter is dead. A few weeks ago I found this deck on Hearthpwn and to be honest it works like a charm. With the right card draw it can easily match jade decks and pirates. I have no stats on it, but I think I have 60% win rate with it. I'm gonna try that deck, I have not played Hunter for months I think! Edited by markmasters at 15:20, 24 Mar 2017. That is some amazing art! I actualy thought tol'vir warden was quite nice, it allows you to thin your deck preventing bad top decks later on and once again another tool that promotes to play cards like twilight drake and mountain giant. People have been crying hunter was put in the 'forced to play aggro' corner for ages now. This is one of the best controll type of cards i've seen. Edited by blob2 at 18:56, 24 Mar 2017. Oh yeah I wanted to ask you about that deck, but I forgot... I believe I tried Reno Hunter some time ago and it didn't go well. But maybe it will be different this time? Hmm, so 10 card revealed. 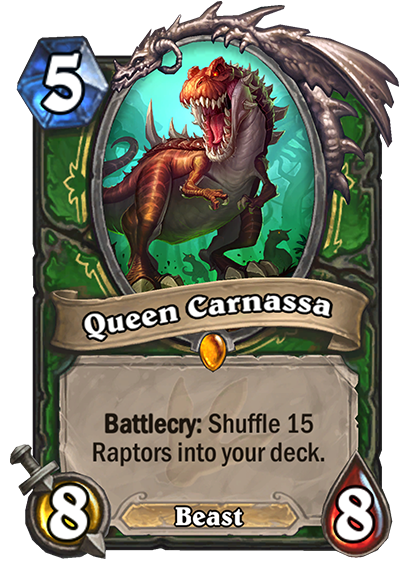 Queen Carnassa is so damn cool. I want both Hunter Legendaries even if they end up unplayable. Because currently I think The Marsh Queen Quest is a bit tricky to play, and meta might hold it down. Although Hunter has some nice 1-drops, and there are more coming, I think inserting 7+ cards of this type might be punishing. Sure, they give us more tools to draw them, but still getting 7 of them through the course of the whole match appears hard to do. And that many of them might actually make your deck weaker, unless you put in a lot of buffs, but that already makes a deck harder to play. Plus it's 'Play' not summon so cards like Ball of Spiders won't work right? Initially I thought that 15 Raptors break a decks consistency. You know: Hunter needs finishers, not drawing sth like Kill Command might be the end of him. But because they cycle each time, they won't deny you that topdeck. Thruthfully I'm really interested in how this card will play out. There are some other interesting card of course. Priests Tol'vir might become staple (useful effect and good stat distibution), especially in Deathrattle decks, Living Mana is an interesting mechanic for Ramp Druid, Gluttonous Ooze is a perfect anti-weapon tech card (it actually might become the best answer for Fiery War Axe and other s*it in the entire game), Mana Bind is a strong yet tricky to play Secret, and Rouge's plant also looks like a useful control card. @Blob - Give it a try. It really is great! I am not sure about that hunter quest? But as far as I understand Allycat and pantry spider count as two. Actually I am not hyped about it! Though the 15 raptors sound so overwhelming. I really hope it is awesome. Between the other reveals I really liked Gluttonous Ooze, Mirage Caller and Corrupting Mist. I have a hard time figuring out that Living Mana. Sounds cool? Is it good? Ahh! This live stream confused me. But yet again I will just say it: The artwork is freaking awesome!!! I have been watching quite a few games this Winter Championship.. And my conclusion is; Rogue is great. Sadly there is only one type - Miracle rogue. But damn the decks are pretty great and powerful as hell..
Edited by blob2 at 14:52, 26 Mar 2017. Yeah this also makes me wonder. I tried to anylyze this but maybe I'm wrong with Rouge overall (as many people, cause Heartshtone players tend to go with the "mainstream opinions" nowadays). Let me say this then: Rouge is "not good" in my case, cause I can't find a deck that suits me. I liked Raptor Rouge very much but it really went weak so I stopped playing it. I have some successes with Pirate Rouge but not on satysfying level. Besides it's not a style of deck I want to play. But whenever I face Miracle Rouge I struggle. People always find a way to run the "Miracle engine" at full speed whereas when I play I can't seem to chain the combos very well. No, I won't say anything in my style: it's luck and RNG. I said it a few times: I'm not good with combo decks, so that's probably the reason. I'm too impatient. Un'Goro looks promising to me cause I enjoy playing mighty Beasts like Dragons and Dinos. When I played MtG I liked either Forest (Beasts) or Dragon decks. The X-pack sports probably the best theme for me since the beginning of this game. I also like Elementals theme and Elemental magic. I really hope the meta will give me a chance to have some fun, cause lately the game started to be really one-dimentional for me. PS: Did anyone try C'Thun Control Rouge? Any opinions? Miracle Rogue is very strong indeed, it is sometimes unstoppable. We saw a turn one 10/10 Edwin in the tournament already, lol. It also looks so strong now because it has plenty of favorable match ups in the current tournament meta. Midrange Shaman, Jade Druid, Renolock and Dragon Priest are all weak to Miracle. I personally don't like it, if Rogue draws good it can't be beaten I think. When they draw bad they fall flat on their face. As an opponent for me it is not very satisfying either way. We saw a 12/12 Edwin yesterday. Mircale Rogue is extremely powerful. But just as you Blob, I do not master it. I really did love raptor rogue as well, and I still play it in Wild. Blob you should check out Shtadatchi - He has some really great decks and he is very gifted at making them. He takes the mainstream ones and give them a little twist that make them different and hard to figure out. Really insightful to watch him play. He is fast, yet very efficient and knows which combos he has and which he leaves behind after each turn. I believe he will win this tournament. Edited by blob2 at 20:03, 26 Mar 2017. I managed to win a few games with a 'fast Edwin' already, even pre-MSoG. It's quite attainable to get him to 10/10 so fast, especially with this new Gadgetzan coin spell. Trogg Beastrager powercreep? Or maybe not... similiar effect I think but less RNG so I guess it's better. I'm prety hyped about Hunter and Shaman this time so I'll be giving them the most attention. Edited by emilsn91 at 09:13, 27 Mar 2017. To be honest Blob the hunter deck is a netdeck. I have actually not tweeked the deck to my liking. I just think it works great at the moment. Three new cards is what I woke up to. The imo bad crackling raptor, the OP new raptor that shuffles a 4/3 raptor into your deck and the new warrior legendary King Most an execute on steroids. I find King Mosh weak and too slow. 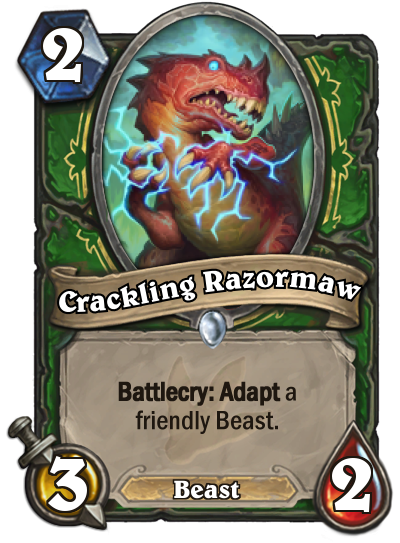 EDIT: Crackling Raptor is not bad.. Sorry. I just took a look at the 2 drops and all the good ones are rotating out.. Soo..
Edited by blob2 at 18:20, 27 Mar 2017. King Mosh might end up like Varian. Usable but not popular. He's not bad but currently too slow. He's probably meant to be used as a boardclear with Whirlwind, but this type of interactions rarely work I think. He's still a cool Dino, so I wouldn't mind getting him from a pack. The Raptor 1-drop seems legit, but getting the shuffled one might be harder then most people think so it won't be that OP maybe? That's a lot of free stuff! Don't forget to grab it when it starts on 29th! Hmm, so a better Huhuran? This will be staple in Hunter decks, even in non-Deathrattle oriented. It's also interesting that we got the name of the Lizards -> Terrorscale. I wonder about this super cool Terroscale which art I posted some time ago. There are Raptors on the art, so maybe this will be a Hunter Epic that gives you two Raptor 1-drops maybe or sth (in line with the Quest)? Hayp is starting to get to me really hard! I don't know man! That Huhuran was never usable, so why should a more balanced one. It might be a three drop, but I'd rather run Animal Companion. I am not convinced! More cards revealed Thunder Lizard and Lightfused Stegodon. They are pushing SHR + adapt function. Pretty cool, but is it too slow?! I believe so. But let's see. I cannot wait for this expansion. One major concern I have about this expansion is how badly it plays with Gadgetzan. Too me a lot of the key elements do not play well. Take the whole buff hand mechanic. It is useless with this expansion. As well as Kazakus/reno decks. Useless. Jade might survive mainly due to its sheer power. Just made me wonder about the dynamic between the two sets. I would wait with evaluating this with Gadgetzan. We still haven't seen most Paladin cards. Maybe the quest will be buff oriented? So Hemet is back and... I just don't know. I can't evalute this card. Maybe it will see play but I just can't say. It looks so 'unneeded'. One thing is certain, it's the first Legendary from the set I don't want in a pack, so I'll probably get him. Hope he turns out like Yogg-Saron (so useful at the end). I really like the effect on Hemet, because it is completely new. It doesn't fit into any current decks, no. But exactly cards like these give rise to new decks, if they work. I watched Trump's reveal video and as he points out it is good for that late game, where you want to draw the big cards and dont want those small drops. So maybe it could fit into a certain type of late game controlish deck? But it does not fit my play style, so I will not be wanting this one. Edited by blob2 at 18:04, 28 Mar 2017. Well, I understand the uses for this card: at first glance it's simple, you throw out low cost cards, however useful, drawing which would otherwise backfire in a Control match-up. So this might be good. But on the other hand 3 mana cards are usually the ones that will find their uses even late game, at least that's how I think a deck should be built.